On Sunday afternoon, a group of armed white supremacists surrounded the NAACP building in Houston, Texas, with banners that read, among other things, "white lives matter." The group said that they were protesting the Black Lives Matter movement, which they say has fostered an environment of violence and has encouraged rioting. They said that they were protesting to call on the NAACP to denounce the movement. See Also: State NAACP leader removed from flight for being "disruptive"
'White lives matter' protest? Outside an NAACP office in Houston?! At least try 'poor white lives matter' & protest the Trumps of the world. 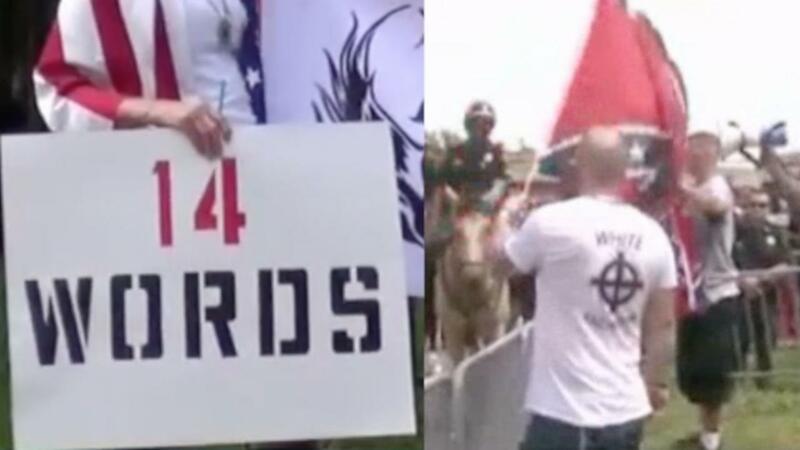 In addition to the banner that said "white lives matter," one protester held a sign that read "14 words," a reference to a white supremacist slogan that says, "We must secure the existence of our people and a future for white children." Police were present on the scene to prevent violence from breaking out.